Three New Brunswick post-secondary education institutions are partnering to create and send the province’s first cube satellite to space, as part of the Canadian Space Agency’s Canadian CubeSat Project. The University of New Brunswick (UNB), Université de Moncton and New Brunswick Community College (NBCC), in a collaborative project referred to as CubeSat NB, aim to launch the cube satellite or cubesat, from the International Space Station in 2021. The Université de Moncton is Canada's largest French-language university outside Québec. With more than 5000 students, Université de Moncton offers 165 study programs, including 38 at the master's degree level and 7 at the doctorate level. Since its creation in 1963, the Université de Moncton has awarded more than 52,000 degrees and has become the single most important centre for the social, cultural and economic development of New Brunswick's Acadian population. 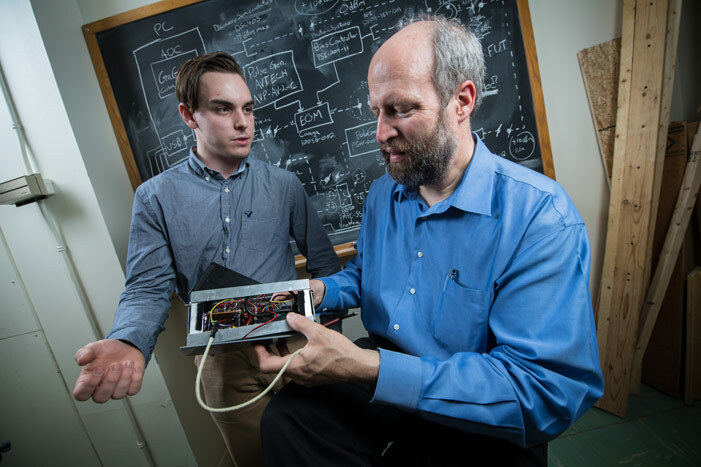 Photo: Electrical engineering student Atlin Anderson and Associate Professor Dr. Brent Petersen examine a prototype cube satellite, also known as a CubeSat. Credit: Cameron Fitch / Photo UNB.